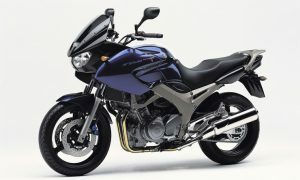 Home » Bike Reviews, News & More » Yamaha TDM900 2002-2011 – Tomorrow’s Classic Bike Today! So we do rather look back at and like the Yamaha TDM900, even if it (and its predecessor the TDM850) didn’t seem to gel with the British bike riding and buying public. Really, we like to look at the TDM as a big-bore TDR250, but instead the rest of you kinda thought it was dull and boring. To examine this history, we need to look at the 900’s progenitor. The TDM850 was a 849cc five-valve per cylinder, parallel twin with a strange ‘Deltabox’ chassis but fitted with half-decent suspension with lots of travel front and rear. The motor itself was originally from the Super Tenere, while the mean, twin-light styling was from Mars, even if the comfy seat and ergonomics could have been designed by those that make Preparation-H. Launched in 1991, strangely it immediately became a hit with those damn pesky motorcycle journalists who were previously loved-up only with sportsbikes. As was usual with the introduction of a new (and quirky) model this attitude lasted all of a year before the spoiled, sulky scribblers had changed their view and called the ‘TDM’ the ‘Tedium.’ Thankfully, the rest of Europe bought the bike in its droves, especially after the 1996 updated which saw the introduction of the 270-degree crank from the TRX850 and an all-new (even more) aggressive styling from the pen of bike designer Glynn Kerr. 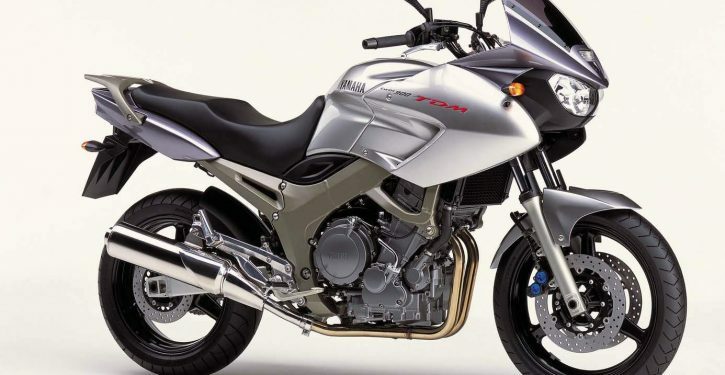 The bike continued to sell big time in Europe, so much so that – by the time its replacement the TDM900 was announced – the machine was the second-best seller in Europe in the 750-1000cc category behind the VFR800. That takes some doing. Updates to the TDM900 – which was launched in 2002 – were many: new frame/chassis, less weight, improved front forks and brakes, updated, fuel-injected 897cc motor with around 87bhp (around 10bhp up on the earlier 850) and digital clocks. Riding the bike it was a lovely mix between a comfy naked and an imposing adventure bike (or big trailie, as we called them back then.) Handling was spot on – even if the front felt a bit soft thanks to those new forks. The 1996-on model had bigger forks and the 900 had rebound and pre-load only adjustable forks, but those powerful Blue-Spot brakes from the R1 really showed up their soft nature. Handling of the 900 was better overall than the 850, thanks to a 40mm longer swingarm, but it did feel lazier, as the wheelbase went up from 1470 to 1485mm. Stable, though. The motor itself was gutsy, too. Riding the 900, you’ve got a useful increase in overall power across the rev-range and more importantly six not five gears and the fuel-injection of the time had no iffy glitches either. Even if we didn’t really take the 850 or 900 to our hearts, today you’ll find plenty out there as it was available for so long – almost 10 years, in fact. Used bikes seem to have gone either one of two routes: either it’s had the full tourer kit thrown at it, or it’s been commuted on and treated with mechanical ignorance – beware the latter, as finish wasn’t the best. Some recalls were made on 900s for checks to the fuel-injection ECU, so check this and the R1 Blue Spots suffer if not stripped and cleaned after a hard winter or four. Owners either put heavier (15WT) oil in the forks or go for harder springs. Some drop the forks 10mm to speed up steering to make up for the longer wheelbase of the 900. This doesn’t affect stability too much. Overall, the TDM900 is practical too – as shown by the fact that Yamaha started to do extras such as heated grips, higher screens, luggage and the like for it. Useable, high milers 900s start around £1200, while the last of the line (which still lingered in dealers for a couple of years after production ceased in 2011) are up around £4300. Whatever… we say £2500 will get a really nice one. AGAINST: Soft suspension needs sorting for real fun! VERDICT: This bike deserves so much more love than we gave it the first time around… try one!